I guess I never saw things from the miner's pov. Sure they know this might not be the best work, but what else can they do? It is the only work where they live. The greenpeace like peeps protesting just do not get that. But this was not a book about miners. This was about Di that returns to get small hometown. She does not want to. She wants to continue her studies, to be away. Alas, her dad was in an accident. And you just feel how the town is trying to drag her back kicking and screaming. And let us not forget the dragon. That made me think of that movie Pete's dragon. There are dragons still in the wild, not many, but there. And he was a decent dragon too...to her at least. It's not a long book, but it does make you think about a few things. I liked her wonder of things, I wish there was magic around too. Good and short. This sounds like a cute story. I do get how miners are struggling. I think that is why the government should subsidize retraining and companies to bring in green energy to those areas. There is a wind power company here in the states that is offering free training for miners to work on the wind turbines. I love dragons and Pete's Dragon was a favorite when I was a kid. I haven't seen the new one. I have read her YA series and really liked it. I'm a sucker for all things dragons so I'm curious about this one. Plus, if it makes you think, that's always awesome. Cool. Do people know there are dragons in the world here or is it a 'how did we miss these giant creatures all this time' kind of plot? Now I want to read this one. I loved Bickle's Amish vampire series but haven't read anything else by her. I am always intrigued by books set in mining towns in WV. My dad grew up in a mining town in VA so he has always told me stories of what it was like. Great review! I've always liked books with dragons in them. This sounds like a good book. I think I would like this one. I'm going to check this out. I don't see many books set in my home state. Huh...sounds interesting. I want to understand more. I like the sound of this one. Love that there are dragons in it. You know, I don't think I've read many books with dragons. This sounds like a good one! Thanks for sharing. Huh. Sounds interesting. I like the idea of a dragon buried deep under a mountain. :) And mixed in with a tale about small town life. Could be a winner. I've always wanted to try her books. I love the quirky title of this one, sounds like a UF that's right up my alley! Had you not mention the dragon, this could've been a realistic fiction. 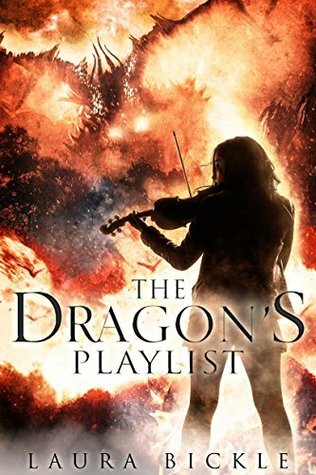 I was reading your review and was just about to scroll up to see if I had imagined the dragon in the title and cover. Then you mentioned it, sounds fun. Hope the dragon was friendly! Sounds like it covers several aspects while telling a good story. Love those types. I still need to try one of her books. Loved the new Pete's Dragon even better than the old one which I loved as a kid. Intersting. Thank's for the review. The setting sound interesting. Destroying a town ? I have to read more about this one. Great review and you have me intrigued. I think I would enjoy this Linda. It seems like a strange mix between fantasy and real world. Does the story come off as a real fiction with fantasy aspects or an Urban Fantasy?